Aviation Updates Philippines - According to airlineroute.net, Thai Airways International will cancel its planned Boeing 787-8 flights to Manila from Bangkok. Recently, the airline announced that it will operate the Boeing 787 on this route from August 8 to August 31 on a daily basis. Instead of using the Dreamliner, Thai Airways International will be deploying its Boeing 777 aircraft for its Bangkok-Manila-Bangkok route. The Dreamliner will also be deployed in Chiang Mai starting July 8 until August 31. This will be followed by Perth and Tokyo Narita in the following months. Last month, Thai Airways International unveiled its first Boeing 787-8 Dreamliner and revealed the cabin products that passengers can expect on the new aircraft. The aircraft was equipped with 264 seats in a two class configuration, 24 business class and 240 economy class seats. 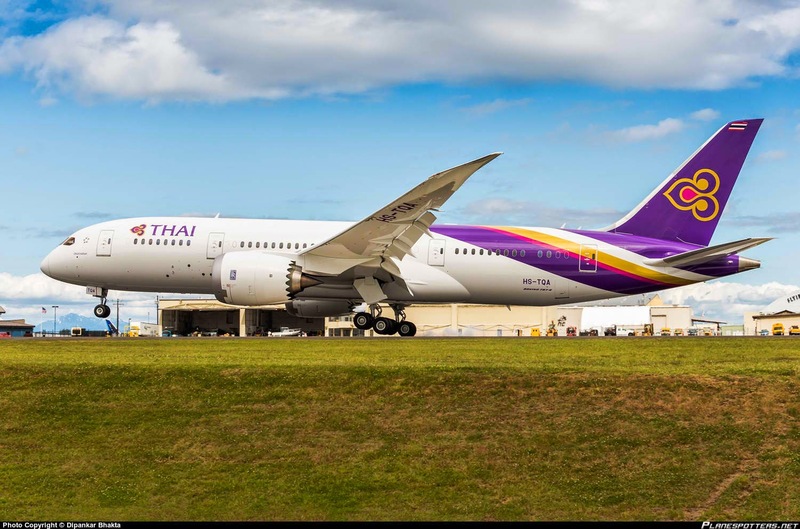 The first Boeing 787 was rolled out of the Boeing Factory in Seattle showcasing Thai's white and purple livery. The aircraft was one of the 10 Dreamliners ordered by Thai, compromising six Boeing 787-8 and four Boeing 787-9. The Royal Silk business class cabin will be equipped with a 16 inch personal television with Panasonic eX3 for in-flight entertainment. The Royal Silk cabin are arrange in 2-2-2 seat configuration that can pitches up to 60 inches. In economy class, seats are configured as 3-3-3 and are equipped individually with 11-inch seatback monitor, also using the Panasonic eX3 in-flight entertainment system. Economy class seats pitches up to 32 inches.